Bring one inch of water to a boil in a large saucepan. Meanwhile cut asparagus into one inch pieces. Add asparagus to boiling water and cook until barely tender, 2-3 minutes. Beat eggs, salt and pepper to taste and the basil until well blended. Heat a large non stick skillet. Add butter and spread to cover skillet. Add the eggs; sprinkle with the cream cheese. As the egg sets, use a large spatula to softly scramble eggs. 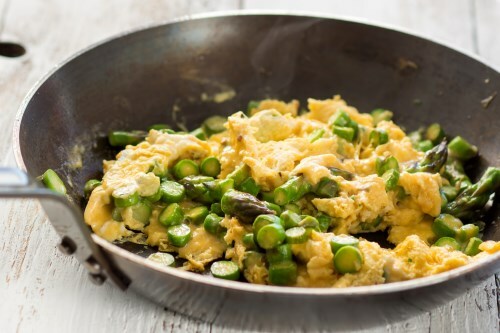 When eggs are still a little runny, add the asparagus and the parmesan. Keep on scrambling eggs until set to your taste. Serve garnished with more basil, if desired.